The title of this post should have had fifty exclamation marks and be in all caps to properly express how excited I was for the cabinets to arrive and be installed! It was Christmas come early in our household that day in October 2013. The cabinets were delivered on a Thursday and the wait until Saturday for them to go up felt like an eternity. They sat in their boxes in the garage, just waiting. Finally, it was Saturday! Cabinet day! Bright and early, Dan’s parents and brother came over to help. We were so grateful of their offer to install our cabinets. 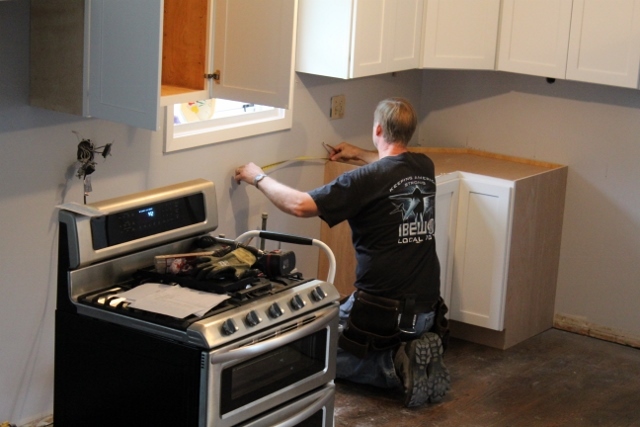 We were told that hiring a contractor to install the cabinets would cost almost as much as the cabinets themselves! If that is the case, then Dan’s family’s generosity really saved us big time by DIYing the install ourselves. Here’s a reminder of how my newly hardwood floored, freshly painted, appliance strewn kitchen looked. Here’s how it looked at the end of the day. Sure, it’s a bit rough looking (did you notice the folding table we used as a makeshift countertop? 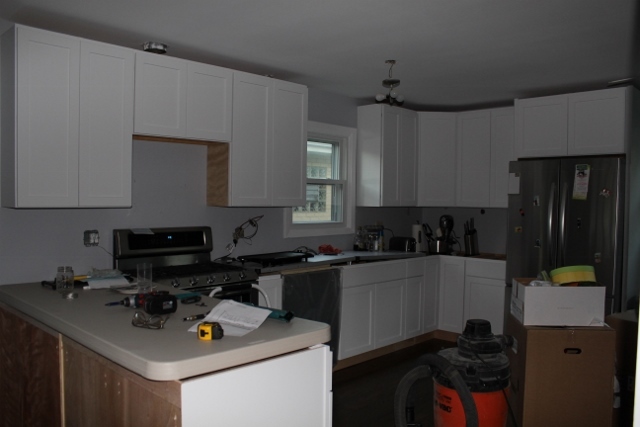 ), but the cabinets and appliances were installed! You’ll notice those boxes in the middle of the floor. Those contained some of my most precious kitchen basic possessions that sat in our basement for three long months. 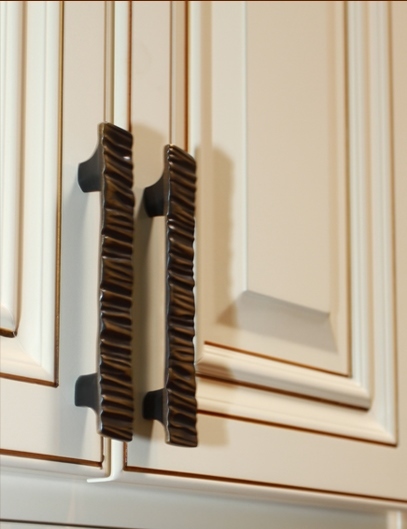 You bet that once all the cabinets were in, I immediately started putting them to good use in housing my bowls, cookie cutters, and silverware. Now, if you know me at all, I don’t think you would expect me to give a step by step tutorial on how how to do a full kitchen cabinet installation. Well, you’d be right. I mostly tried to stay out of the way as the men carried the cabinets through the house, hoisted them high on the walls, and secured them in place. I think I was painting a door or something, you know, a job that was tedious and messy, but not altogether too difficult. I did notice there was a lot of measuring, marking the wall with pencils, consulting the floor plan, then more measuring. It all paid off though as by the end of the day, all the cabinets were in place! Finally, we were able to make progress in our kitchen remodel. Now, as I mentioned before, the kitchen was still looking pretty rough. The fridge and stove worked, but the microwave wasn’t in, there was no sink (or running water), we didn’t have countertops, light fixtures and a fan needed to be moved/installed, the peninsula had a wooden back, the floor trim wasn’t in, we were missing all decorative finishes (cabinet/drawer pulls, backsplash, cabinet trim, under cabinet lights, etc…), and there was still so much left on our to-do list, but for the first time since we lived in the house, our kitchen actually LOOKED like a kitchen. 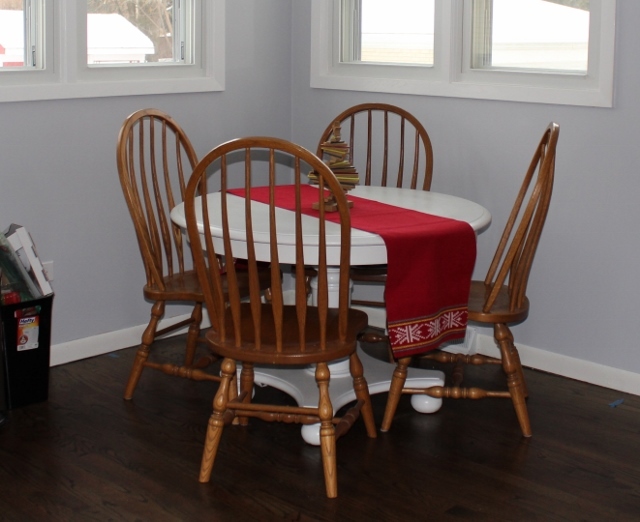 The next step would put our kitchen into functional mode – the countertop! Project #3 of the Great Cabinet Wait sounds tasty, doesn’t it? Sorry to fool you, as no food was made as part of the project. I had an old Italian cookbook that I found a thrift store a while ago. Looking through it and reading all the old Italian recipes was fun. While thumbing through, I saw that there were a few pages in the middle of the book that had diagrams of all the different types of pasta. I knew I wanted to turn that into wall art somehow, and that it would be perfect for the kitchen. 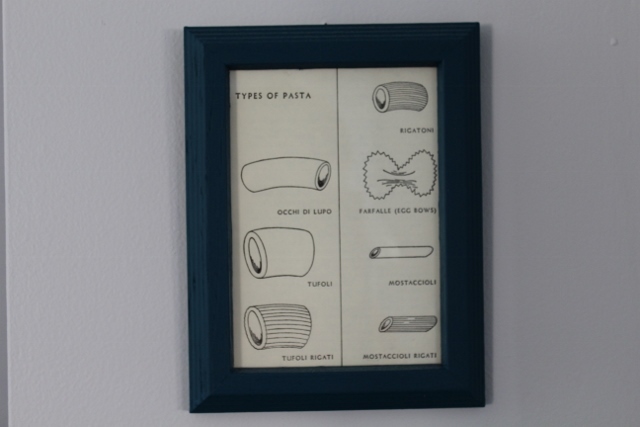 I found three matching frames that were about the size of the pasta diagrams at the same thrift shop months later. 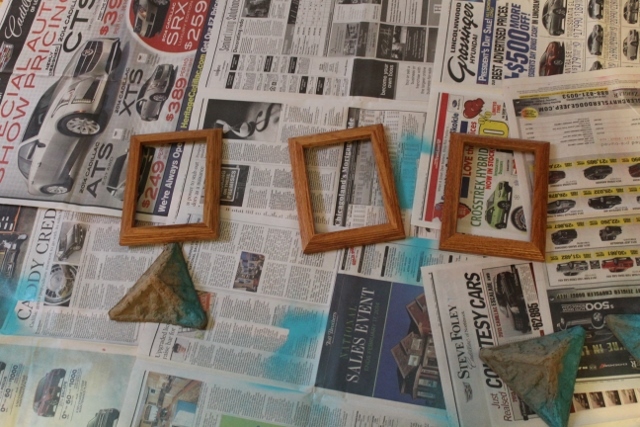 I wasn’t into their light wood coloring, so used more of the blue paint from the Cucina sign. I was really getting my money’s worth from that quart of paint! Sidenote: Do you notice a theme here? 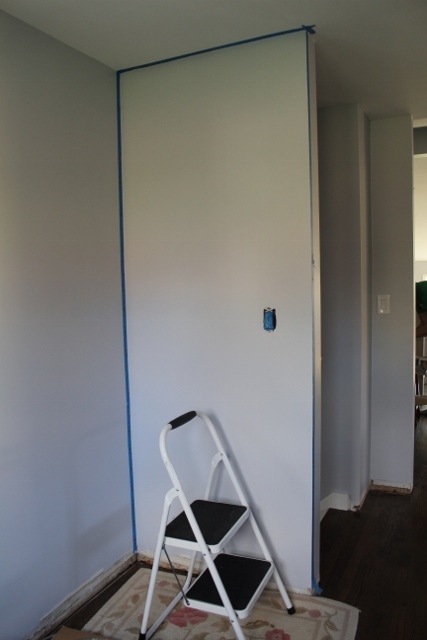 Many of our updates involved painting, which I think goes to show how big a different paint can make whether its on a wall or used in a small project. I digress. 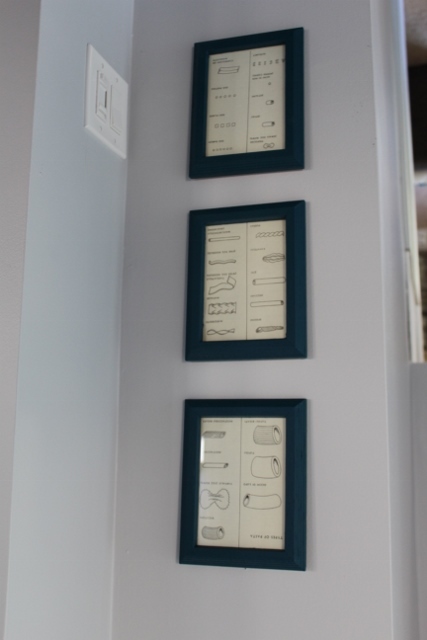 After the frames were dry, I reassembled them and added my favorite pasta diagrams to each one. I asked Dan to hang them in a column, down a very small corner wall space we had in the kitchen. It was recessed back a little bit, so I knew the frames wouldn’t get bumped very much. A few minutes later, my frames were there on display for all to see. Here’s a close up of the top frame. The pasta frames bring to mind so many different memories that are interwoven with pasta meals. They make me think of my Nonna making pasta by hand with it drying on towels all around the house. Sometimes, I think about the time Dan and I made our own angel hair pasta for the first time with my new KitchenAid attachment, a gift from my in-laws. Lately, I think about a Friday night pasta dinner that I hosted for our friends. That’s why we try to only hang meaningful wall art – it makes you happy every time you see it. Project #2 in the Great Cabinet Wait was updating a wooden sign from our apartment to hang in our new kitchen. Our apartment kitchen cabinets didn’t go all the way up to the ceiling, which left room above them to decorate. Or store things. Either way. 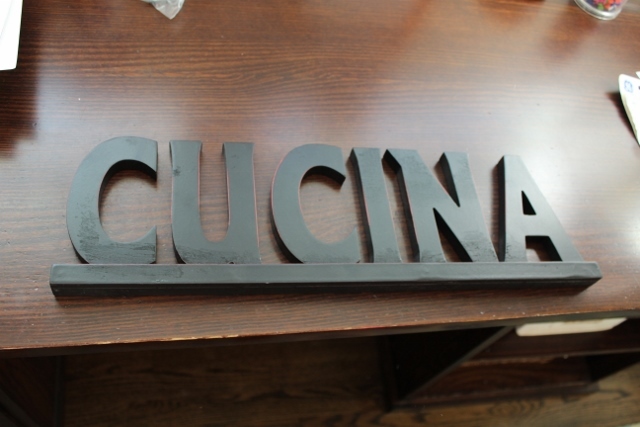 My mom knew I was looking for a decorative item to put above my cabinets and bought me a medium-sized wooden sign that read “Cucina” which means kitchen in Italian. I liked the modern font used, and I put it atop the wine rack above our fridge. There it sat until moving day. 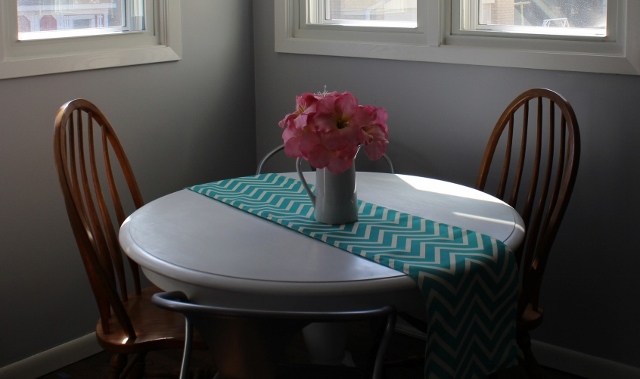 When I brought it to the new house, I didn’t think it would would well in the kitchen, color-wise. It was black, with a bit of red popping through its distressed corners. Our kitchen plan was to have mostly white, grey, and blue tones, so I thouhght the sign would look out of place. Nothing a little paint won’t fix. 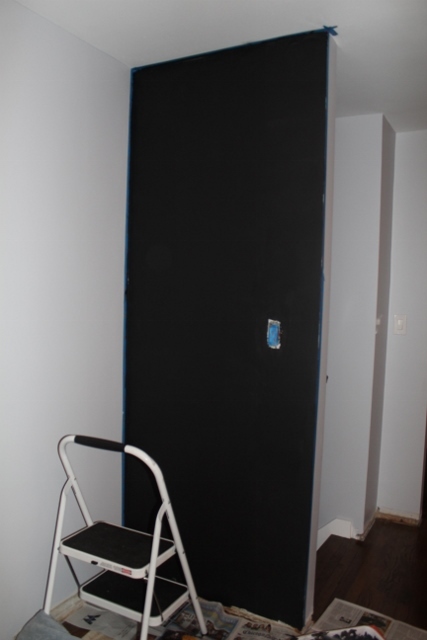 We had some of the blue paint leftover from when we painted the desk for our guest bedroom, so I thought I’d use it some of it on this project. I sanded, wiped down the wood, then did 3 coats of paint. As always, I let paint dry overnight. The next day, I was trying to figure out where to put the sign. I thought it might look nice over the window by the sink, but I realized you would only be able to see it if you were standing in the kitchen. If I hung it over the window looking out onto the backyard, you would be able to see the sign from anywhere in the kitchen, and even the dining room and living room. A couple nails later, the sign was up, letting all who visit know exactly where the cucina is. Remember, when the sign was hung, the kitchen was just a big empty room. It’s good we labeled it. Wouldn’t want someone thinking it was a furniture-less family room. Some people buy their appliances after they buy their cabinets. Usually, unless you’re importing a wood burning pizza oven from Italy, appliances are ready to be shipped to you quickly, and you will receive them in a short period of time. Hence, how we had a beautifully floored and painted kitchen, no cabinets, and a bunch of appliances scattered around the room. Because my focus at the time was spent mostly on cabinets and trying to make a decision on them quickly as possible (cabinets can have a looooooong delivery time), the appliances weren’t really high on my research priority list. A fridge is a fridge, right? Wrong! I highly recommend choosing appliances before ordering cabinets. The two go hand in hand, so you will want to have a mostly set kitchen design, allowing for a little wiggle room in case of a change. Generally, you would probably be OK if you pick a standard size stove. When you order cabinets, the designer asks how big of a stove you expect to have. There are standard sizes, so even if you don’t know your stove size yet, if you commit to a particular size, you will still have plenty of options. Same thing with the dishwasher. However, it seemed like the size for fridges varied greatly, depending on if you planned to have the model be a top-freezer, a bottom-freezer, a side by side, a french door…you get the picture. I was all set on a stainless steel bottom-freezer when Dan suggested we go check it out at the store. You know, just to be sure. Boy was I glad he dragged me to Sears during a rainstorm. I took one look at the fridge I had chosen online and immediately didn’t like it. The fridge just wasn’t big enough. I knew we’d have a spare fridge with a freezer in the basement, but I didn’t want to have to go down there all the time for all the food items that wouldn’t fit into this fridge. 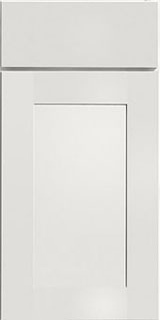 Directly next to the floor model I had just nixed was a gorgeous french door fridge. I knew it was what I wanted. 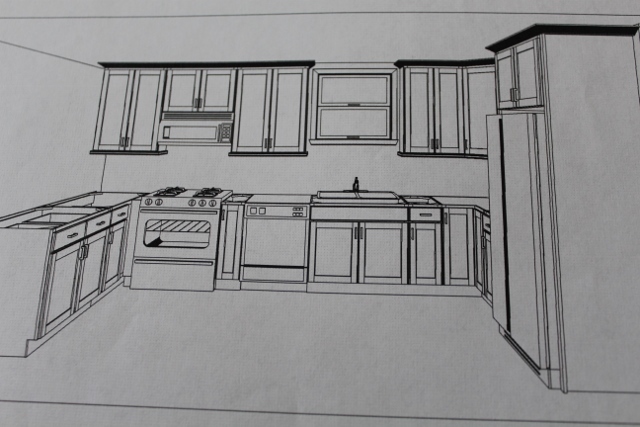 Luckily for me, the fridge placement in our kitchen plan was the farthest item on the right in the kitchen. No cabinets were planned to be to the right of it, and there was additional room to expand the plans farther out, the only con being it would just cut a few inches into the seating area. So, picking a bigger fridge wasn’t a huge deal in our layout. But, can you imagine if our fridge was more central in the kitchen and we had already ordered our cabinets? 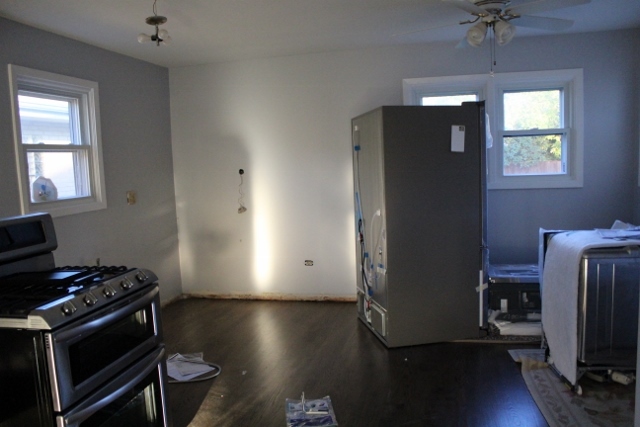 I wouldn’t have been able to make the swap out, and I would have had to have the smaller fridge than I didn’t like in a kitchen I was building from scratch, all because of an oversight on my part. Let me tell you, the reason I was even willing to take on such an extensive remodel was that when it was all over, I would have my dream kitchen. That kitchen didn’t include the small fridge. 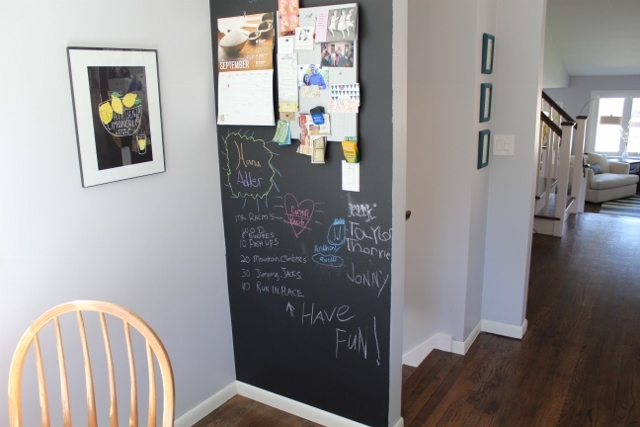 I think issues like this are the hardest part of a DIY renovation; missing something small that has bigger implications that you could foresee as a non-professional. Luckily, the fridge issue was avoided by some smart thinking on Dan’s part and only cost a trip to the store on a rainy summer evening. I could easily see where this small issue would have not even been given a second thought until the appliances arrived. I guess I’m just sharing this cautionary tale to illustrate how each and every decision, no matter how big or small you think it is, is an important one that should be made based on research and informed decision making. Don’t end up with a small fridge because of an oversight, like we almost did.